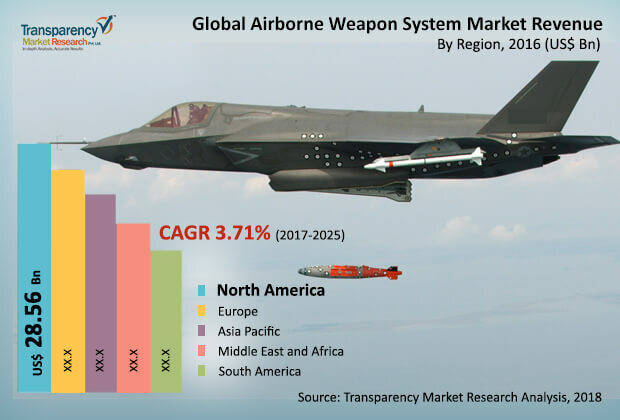 The global airborne weapon systems market features the presence of a handful of companies, with most of them domiciled in North America and Europe. The level of competition in the market is rising with the vast rise in technological advancements. The vast initial capital and technological expertise required to enter the market serve as tough barriers for small and regional players, proving as a huge advantage for established companies to strengthen their hold on the market, observes Transparency Market Research in a recent report. Companies in the market are putting more focus on the development of innovative and more effective products and are looking for growth opportunities across emerging markets. Some of the leading companies in the market are Safran Electronics & Defense, FN Herstal, Boeing, BAE System, Airbus, Rheinmetall AG, Raytheon Company, SAAB AB, Lockheed Martin Corporation, and Ultra Electronics. The global airborne weapon system market is expected to expand at a CAGR of 3.71% during the period from 2017 to 2025, rising to a valuation of US$95.21 bn by 2025. Among various weapons types, the missiles segment dominated the airborne weapons market followed by bombs in 2016 and anticipated to grow at a CAGR of 4.05% during the forecast period. Technological advancement in missiles to destroy enemy aircraft or helicopter at faster speed is one of the key factor driving the demand of missiles segment in airborne weapons market during the forecast period. Geographically, the global airborne weapon system market is dominated by North America and Europe. These regions are likely to contribute a significant share in revenue to the global market during the forecast period as well, thanks to the vast defense expenditure and the well-established defense weapon manufacturing industries in these regions. However, Asia Pacific and Middle East are also expected to contribute significantly due to the high demand for technologies such as radar sensor, nuclear technology, and laser sensor in missiles and bomb in these regions. As war disputes between enemy countries continue to rise across the globe, more and more governments are establishing fleets of airborne weapon systems to improve in-land safety and security. A massive rise in terrorism activities is also compelling the increased adoption of airborne weapon systems, driving global demand. Developments across Asia Pacific market could prove to be highly promising for companies operating in the airborne weapon system market. The market is also driven due to the vast pace of advancements observed in the field of sensors, electronics, and associated technologies in the past few years. Steady rise in military and defense spending of countries across regions such as Middle East, North America, Asia Pacific, and Europe is also leading to the increased adoption of airborne weapon systems. All these factors are expected to empower manufacturers to focus more on development of innovative, advanced, and more accurate targeting technologies in the near future.